Greg Slater (McMaster U.) (CRC (Environmental Isotope Biogeochemistry) is a recipient of an Ontario Ministry of Research Innovation Early Researcher Award. 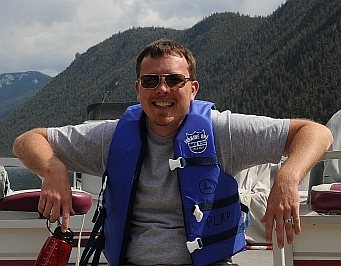 He is a Co-PI of the CSA Astrobiology DWG, was the organizer and convener of the 2nd Astrobiology Analogue Workshop and is working as a collaborator as part of the NSF Life in Extreme Environments (LExEN) program and the Indiana-Princeton-Tennesee NASA Astrobiology Institute. Greg Slaters’ research interests focus on biosignatures of microbial life in extreme environments and geologic systems. Dr. Slater is an international leader in the development and application of techniques in compound specific isotope geochemistry to understand microbial carbon sources, cycling and biosignatures. His research group and state of the art laboratory facility for compound specific stable and radiocarbon analyses will provide excellent CATP training opportunities in understanding microbial carbon sources, cycling and biosignatures and involvement in his ongoing CARN-supported astrobiology projects in Pavilion Lake, the Arctic, and the deep subsurface.